Scott Weiland (born Scott Richard Kline on October 27, 1967 – December 3, 2015 in Bloomington, Minnesota) was an American musician, lyricist, and vocalist, most notably known for his work with Grammy Award-winning rock band Stone Temple Pilots. Weiland is also known for his five-year career with supergroup Velvet Revolver and his own solo career. Weiland is one of the most successful frontmen to emerge from the 1990s. His onstage persona is known as being flamboyant and chaotic and is known to constantly change his appearance and vocal style. Despite his success, his career has been plagued with heroin addiction, as well as several arrests. However, according to MTV News, Weiland has been free from heroin since 2002. 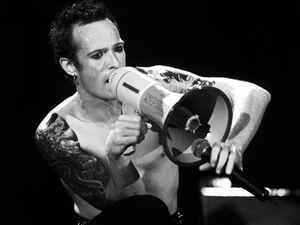 In 2007, Weiland was placed at #57 on Hit Paraders list of "Heavy Metal's All-Time Top 100 Vocalists." Scott Weiland was found dead on December 3, 2015. His personal manager discovered his body in Weiland's tour bus.